Al Ain: Authorities dismissed reports of an earthquake hitting the northern emirates on Sunday night as a sandstorm continued to rage across the UAE. “It’s a rumour and we deny it,” said an official of the National Centre of Meteorology and Seismology (NCMS). 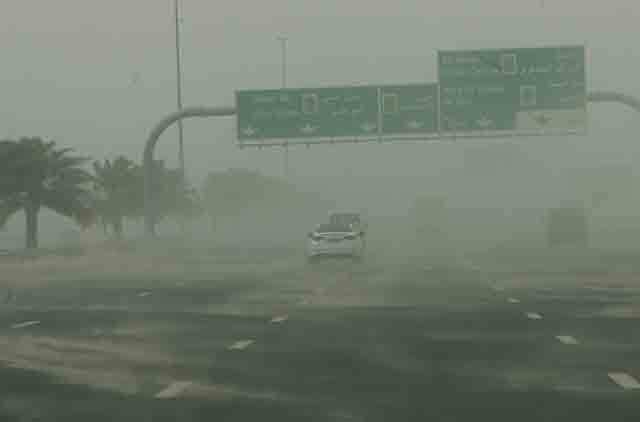 Dubai: Some of the roads have been partially closed to traffic temporarily and diversions have been put in place, as sandstorm continues to engulf the city, traffic officials told Gulf News on Sunday. The measure comes as a step to avoid endangering the lives of motorists, owing to the huge amount of sand accumulated on some roads that could lead to slippery roads, said Hussain Al Banna, Director of Traffic at the Roads and Transport Authority’s (RTA) Traffic and Roads Agency. “The Lahbab road has been completely closed to traffic since earlier today, due to dangerous levels of sand accumulated on the road. 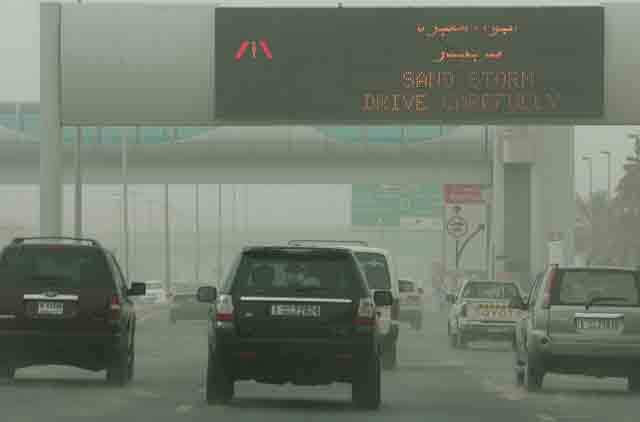 This was a necessary because motorists may otherwise lose control as sand makes the roads slippery,” said Al Banna, who is also the Deputy Head of Emergency and Crisis Management team at RTA. The road will be opened to traffic once the sand collected in removed by workers tasked with the job. In several other areas, such as Al Qudra road and parts of Jebel Ali, some tracks have been closed to traffic as sweeping of the roads are in progress, he said. Whenever the city is hit by poor weather conditions, the RTA’s Emergency and Crisis Management team gets into action, coordinating road safety efforts in conjunction with Dubai Police and the weather forecasters. Warning messages such as “unstable weather, drive carefully” were displayed, throughout the day, he said. The RTA is also coordinating with its contractors who are engaged in various road works as well as the municipality, he added. “Our contractors have been asked to designate a dedicated team of workers to modify road signage, as and when needed.” The team will continue to be on high alert until on Monday morning. Al Ain: Forecasters say the sandstorm will soon calm down as cool north-westerly winds have been setting in across the country. 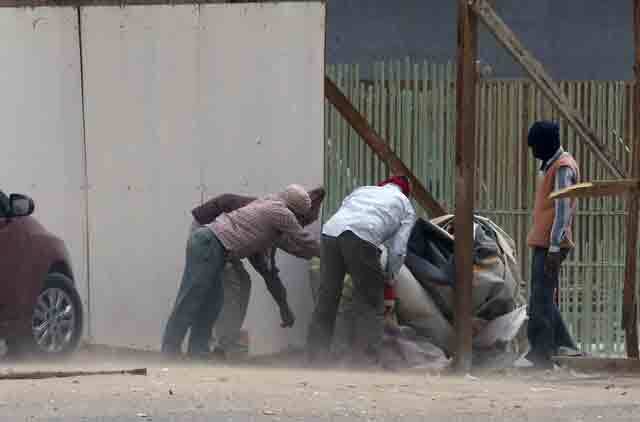 The National Centre of Meteorology and Seismology (NCMS) said the dust storm has started receding and rumours of a cyclone development hold no water. The country was under the influence of strong southern winds pushed in by a low surface pressure since Saturday afternoon. The system first triggered sandstorm in Saudi Arabia and then shifted the wind energy to the UAE. “This development is now almost over as clean and cool north-westerly winds have rapidly been setting in to put an end to the dusty conditions,” said a forecaster. Satellite imagery shows the system has rapidly been pushing dust and clouds towards Iran and Pakistan and clear skies would emerge soon. “These were difficult conditions, but people should not spread rumours as they cause panic,” said a forecaster, asking people to stay calm. “Selected flights departing Dubai were delayed for a brief time,” an Emirates spokesperson told Gulf News in an emailed statement, adding that adverse weather had minimal impact on operations. “Emirates apologises for any inconvenience caused to those passengers affected,” add the statement from Dubai-based airline, which operates services from its hub at Dubai International Airport. Abu Dhabi-based Etihad Airways did not confirm any disruptions to its flights at Abu Dhabi International Airport, sources said not much disruption was expected. Meanwhile, tanker operations at the Jebel Ali port were suspended Sunday morning due to poor weather. “Operations in Jebel Ali port have been halted temporarily due to the current weather conditions. 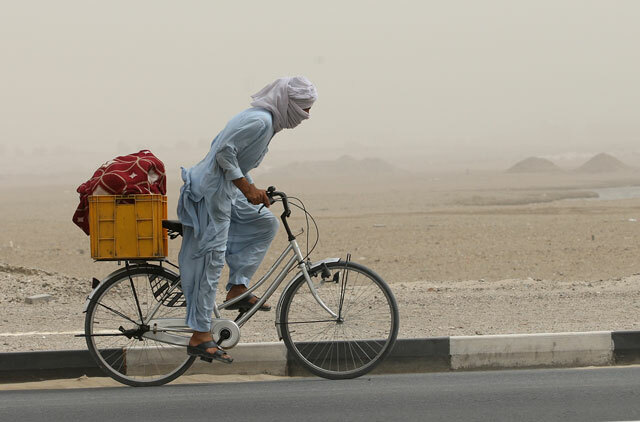 They will be resumed once the sandstorm eases,” a DP World (the port operator) spokesperson told Gulf News in a statement. Dubai: Weather once again intervened a day before the start of the main round of the Dubai Duty Free Men’s Open here on Sunday. With a sandstorm gaining momentum from early Sunday, ATP Supervisor Gerry Armstrong was forced to move the final round of qualifiers by three hours for a 2pm start on Sunday. The national weather bureau has reported showers in Ras Al Khaimah and parts of eastern emirates on Sunday morning. The southern winds have been replaced by north-westerly winds. These winds have been blowing at a speed of 43km/h in the western region of Abu Dhabi. 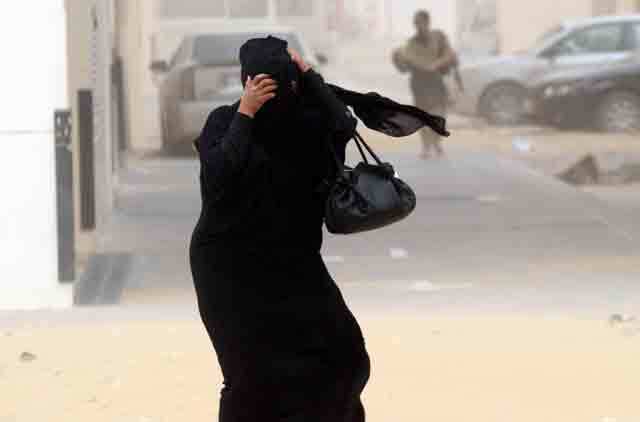 Earlier report from Dubai: Strong southern winds kicked up sand and dust across the UAE on Sunday. 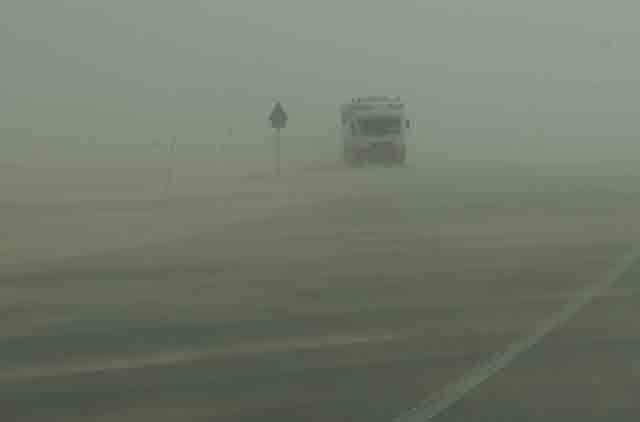 Motorists, trying to reach their destinations on time, were seen struggling to negotiate their way through strong wind and dust. Dubai Roads and Transport Authority's signboards alerted motorists to slow down and drive carefully as road visibility dipped drastically. Many schoolchildren and office-goers, back after a weekend, were seen huddled in street corners waiting for their transport to arrive. The sandstorm is being triggered by southern winds originating due to low surface pressure developed over northern Saudi Arabia, according to the National Centre of Meteorology and Seismology (NCMS). Some schools in Dubai declared a holiday on Sunday due to the bad weather. 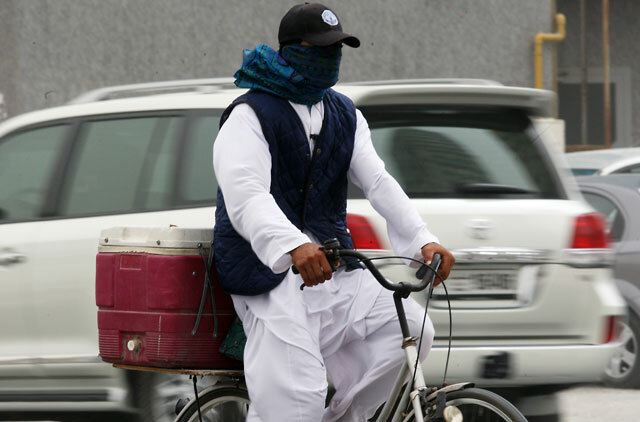 “I felt like chocking… I am allergic to dust,” said a motorcycle rider in Dubai. 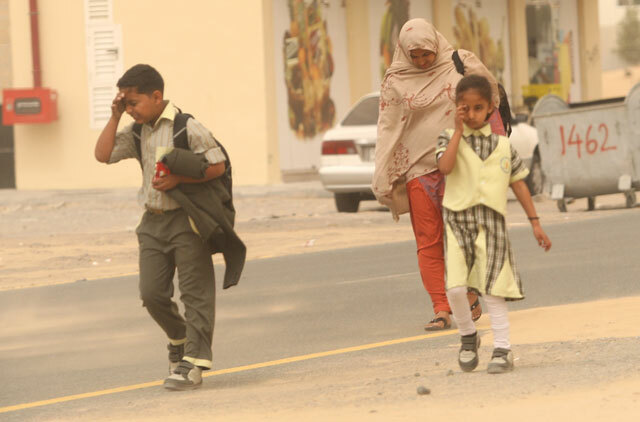 According to NCMS, temperature levels are expected to drop across the country on Sunday. “The wind was too strong. I stayed in my car for a while after reaching my office,” said a Sharjah-Dubai commuter. The weather centre has also urged people to stay away from the sea as the strong winds of 25 kilometers per hour will make the sea rough. 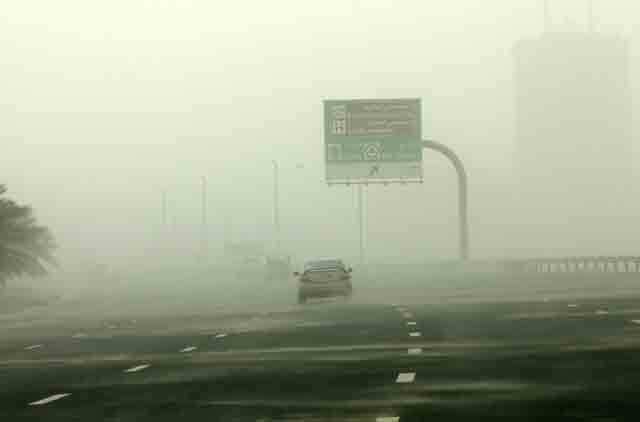 “The weather was bad since Saturday night, but morning traffic on Shaikh Zayed Road was fine,” said a Dubai’s Palm Jumeirah resident heading towards Safa Park area in Dubai on Sunday. 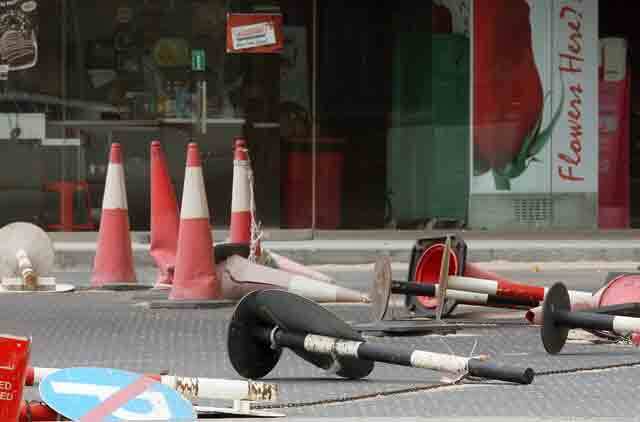 “Traffic was slow moving from Bur Dubai to city centre on Sunday morning… the wind is really strong,” said another commuter. According to NCMS, southerly wind will give way to northwesterly winds later on Sunday, affecting the western areas, and gradually extend towards rest of the areas, with a fall in day temperatures. 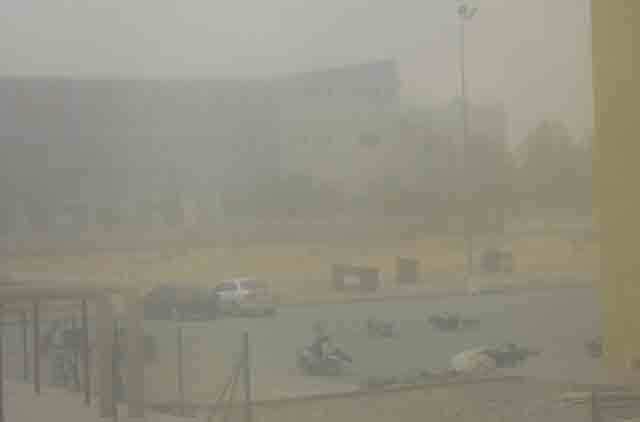 "The sandstorm in Mission Impossible 4 may have been a huge exaggeration, but today’s sandstorm came pretty close. Unfortunately I had put out laundry to dry on Saturday night and when I woke up I found a couple of T-shirts missing and when I looked down from the balcony I found them down in the parking lot," said a Dubai's Karama resident on Sunday .